AI Factory are specialists in quality, casual AI game engines and superior AI characterisation in full 2D and 3D games for PC, console and mobile. Our Chess app was designed to make sure that most people had all the things they wanted. Over a period we added more and more. However it seems that some of our newer and newbie users were a tad overwhelmed by so many options. Most chess products provided few and therefore seemed more friendly. To address this we re-designed options so that the default was less intimidating, but with still an option to access all advanced options. 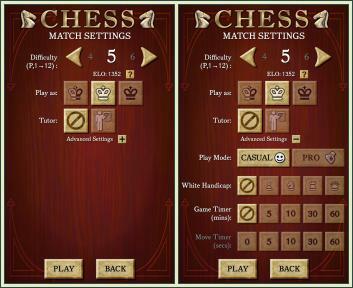 This brought our chess more firmly into the "friendly chess" fold that many users wanted. We also added inducements that made suggestions to the player in response to their progress. AI Factory's core activity is the development of traditional and casual games created around quality AI game engines, with an easy-to-use and feature-rich interface, including a high level of characterisation. We have developed complete game software on PC, console and mobile. Alongside quality 2D games, AI Factory has created lavish 3D versions of a selection of classic games, bringing traditional games up-to-date with other genres in the games industry. We have state-of-the-art AI game engines for an ever-growing range of casual games, including traditional board games, and parlour pastimes from East and West (chess, bridge, backgammon, reversi, shogi, chinese chess, chinese checkers, go, amazons, checkers, four in a line, gomoku and many more), classic card games (bridge, poker, hearts, spades and euchre), puzzles (taipei, dominoes, treasure hunt and others) and life-simulations (including darts, pool, snooker and football). Many of these game names are instantly recognisable brands, as well as sitting firmly in the casual games genre, currently a fast growing gaming market. AI Factory produce a free publication that includes articles on game AI and engineering. You can sign up for this periodical for free, to get your own copies of these articles and keep up to date with other AI Factory announcements. This is the official website for AI Factory's Shotest Shogi engine, featuring information on all games using the Shotest Shogi engine.